I am pleased to announce the publication of Evolution and Human Culture: Texts and Contexts, my fourth monograph and sixth scholarly book. Evolution and Human Culture represents three years of sustained work, and I am grateful to St. Francis College for a Spring 2015 sabbatical which enabled me to navigate significant progress toward completion of the text. I'd also wish to thank my editors, Francesc Forn i Argimon and Eric van Broekhuizen for their generous support. The book is published by Brill, a European publisher with a distinguished history that extends back three hundred years. More importantly, the book is now part of the prestigious Value Inquiry Book Series/Cognitive Science, edited by Prof. Argimon. You can find the Preface, Table of Contents, and chapter subheadings, as well as a link to the Brill site, here: https://sites.google.com/site/gftague/ Please ask you library to order a copy of this important book and, if applicable, consider it as a course text or recommendation. Evolution and Human Culture will be valuable to students and scholars of the arts, humanities, and cultural studies, as well as moral philosophers, who would be interested in reading about key intellectual developments in their fields. Biologists and social scientists would benefit too, since the book provides a window into how scientific research contributes to understanding the arts and humanities. The book offers a comprehensive entry into evolutionary cultural studies. The take-home point is that culture does not transcend nature; culture is human nature with moral sensations at bottom. Subject headings applicable to the book, according to the publisher, include: 1. Philosophy;Ethics and Moral Philosophy; 2. Biology;Zoology; 3. Art History;Archaeology; 4. Philosophy;Philosophy of Mind; 5. Social Science;Sociology and Anthropology. As an early, anonymous reader points out, my book argues for the interaction of biological and cultural levels relying on an impressive amount of data from the natural and social sciences that show how certain culturally-related behaviors contribute to the selection of certain biological traits and vice versa; this thesis is supported by reference to abundant comparative studies with several species of nonhuman primates relatively close to our own. “Professor Tague has mapped out the paths taken by anthropologists, primatologists, evolutionary psychologists, neuroscientists, and philosophers who have traveled where human culture and human biology intersect. Different disciplines have discovered different areas of this biocultural landscape and have returned with different ideas; Evolution and Human Culture provides an impressively-complete account of these diverse explorations. An intrepid explorer himself, Professor Tague provides his own take on the importance of culture to human evolution – that culture emerged as a means of creating and maintaining the norms that enable us to be so highly cooperative – but only after laying out the full spectrum of perspectives so clearly that he enables his reader to entertain interpretations differing from his own.” -Christopher X J. Jensen, Ph.D., Associate Professor of Ecology and Evolution, Pratt Institute. “Evolution and Human Culture is a milestone piece bringing together philosophy, the sciences and the arts in an original and stimulating read. Culture, art, morality and evolution – a striking unification that is unique to this work.” -Kathryn Francis, Fellow, CogNovo Institute, Plymouth University. 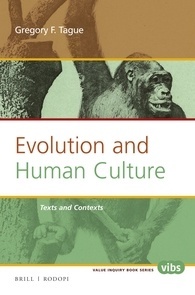 “Evolution and Human Culture provides a very well written account of evolutionary theory across the spectrum of relevant disciplines...addressing...the most challenging questions that face humankind.” -Daniel Meyer-Dinkgräfe, Ph.D., Professor, University of Lincoln.